All incoming 7th graders must provide proof of a tdap booster prior to beginning school! 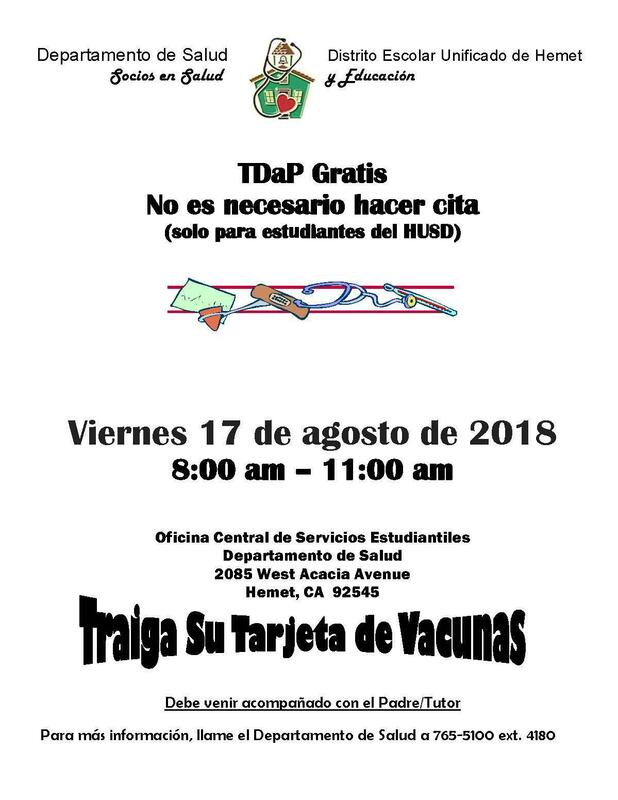 1791 W. Acacia (Centralized Enrollment) opens Monday, August 13th, 2018 at 8am. HUSD currently employs 8 credentialed school nurses, referred to as District Nurses, who oversee health services at our school sites. District Nurses are Registered Nurses with a Masters or Bachelors degree and specialized training for the school environment. The Health Services staff at HUSD are here to advocate for health. We believe healthy children learn better and we can often assist with accessing health care. In addition to the District Nurses, HUSD is fortunate to have a Health Technician, trained in first aid and CPR, at nearly every school site. The primary role of the Health Technician is to provide basic first aid for unexpected injuries, to assist with medications when it is determined they must be given at school; and to maintain health records on all children attending school at their site. Health Technicians are able to reach the District Nurses by cell phone as needed. District Nurses often participate in school meetings and may meet with parents and students at school or home to discuss health concerns. Anyone can refer a student for health concerns. State law requires District Nurses to provide yearly vision and hearing screenings for grades Kindergarten, 2nd, 5th and 8th (10th grade is optional). In addition, first grade boys are screened for color vision. Parents will be notified if problems are suspected so they may seek further medical care. Parents or school staff may also request the screening of any student by contacting the Health Technician. 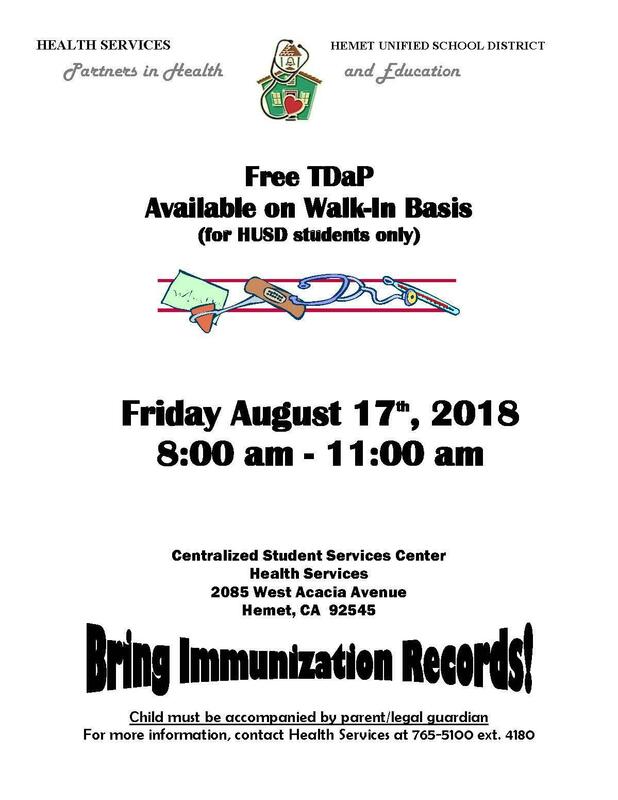 Immunization clinics are offered to HUSD students at the District Health Office, for students with no health insurance or with Medi-Cal. The Clinic is open the same calendar as the school year, see below. Relay important health information on your child's emergency card every year. Speak with a District Nurse, Health Technician and teacher(s) regarding serious health issues. Include a working phone number for you and working alternate numbers in case of urgency or emergency, and update the school office as needed. By law, the school cannot administer any medication, including over the counter medication, or treatment without parent permission and a physician's order. We can assist your with this process, please ask.